Cool! Save an average of 20% on CountryAttire.com with 10 Coupon Codes, and 27 Deals! 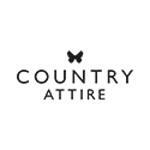 Country Attire offers a wide but selected range of the best country clothing and footwear from the best and most trusted brands. These brands include Barbour, Hunter, John Partridge, and Liberty Freedom. Visit Country Attire now to browse through these magnificent products that will surely catch your attention. Details: 15% off order when you Spend over £150. Expires on 12/17/2013. Details: 25% off order when you Spend over £750. Expires on 12/17/2013. Details: Get up to 70% off sale reductons. 10% off first order over £50 with newsletter sign up. Details: 10% off first order over £50 with newsletter sign up. Details: 20% off when you Spend over £300. Expires on 12/17/2013. Details: Free Gift with any full priced Hunter Boots. Expires on 08/12/2014. free delivery and returns within the uk. Details: FREE Delivery and Returns within the UK. Details: Shaped Liddesdale Jackets for ladies have 20% off for a limited time only! Simply search for "Shaped Liddesdale" at Country Attire to see the colours available, free worldwide delivery as standard :) Other great deals are for Newsletter subscribers only so sign up for more offers! Details: 20% Off Hunter Boots. Expires on 11/07/2013. Details: 10% off order when you Spend over £50. Expires on 12/17/2013.